There are only two perpetual, all-encompassing truths in this world, according to the twenty-four year-old Syrian artist—love and death.“Which One Is Your Thread?” is Noor Bahjat’s first show here in the Philippines, and the exhibition is a culmination of her three-month long stay here in Manila. Projected upon her canvases are expressive daubs and strokes of paint that thrust and offer poignant musings and the most contemplative of gazes. Visually relayed by big, knowing expressive eyes they are ones that manage to appear glazed yet penetrating, and they hold and sustain you in some strange, hypnotic suspension. Born and raised in Syria, her motherland’s current political condition has entailed her and her family to depart the country almost five years ago for the glimmering desert emirate of Dubai. She graduated with honors at the University of Damascus and her last exhibition and residency was held at Ayyam Gallery in Dubai. 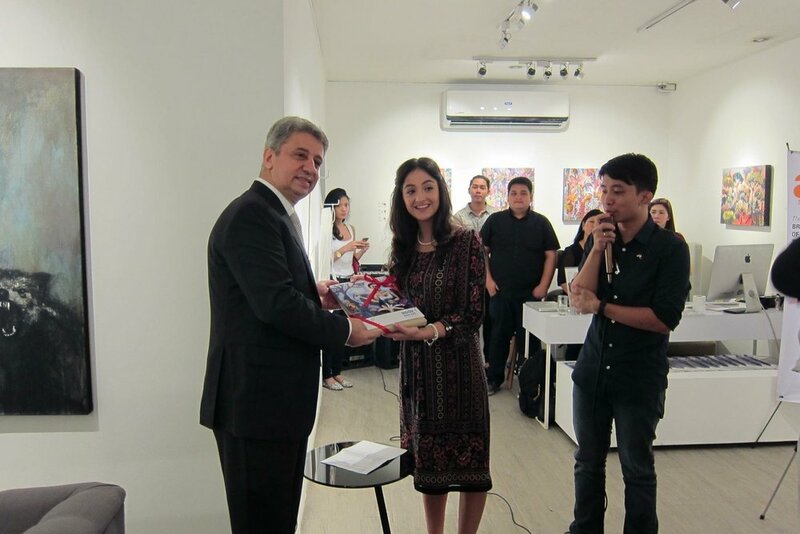 Noor is the first recipient of Galerie Stephanie’s first-ever artist-in-residency program. Since February, she has found herself embedded in the middle of this colorful megalopolis that is Manila, sometimes surrounded by oceans but always by spectral contradictions and feverish contrasts. 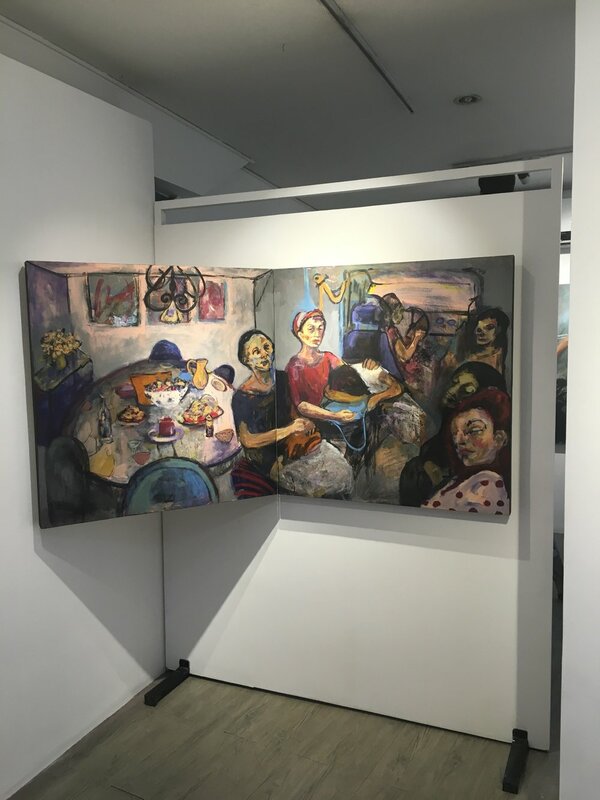 “One of the very first things I saw in this country was how huge the gap between the rich and the poor is.” She paints a disquieting portrait of this searing observation in one of her paintings, a diptych with a contemplative woman, placed right at the very center of its middle edges. Noor uses the twin panels of the diptych to paint a portrait of a woman living two parallel, yet starkly different lives. The woman personifies all of ourkasambahay—kasama sa bahay—the one who lives with us in our homes, the one to whom we entrust our domestic concerns and household drudgery, the one who offers service to fulfill the work that we otherwise dismiss to be too menial and minutiae to do. One of her halves reside in a stately house, the other rides the jeepney, perhaps taking it to return to her own home. There are two inextricably intertwined—yet somehow irreconcilable—strands to the thread of her life. She is link and conduit between these two worlds, two parallel lives running together. It can be said that no one is exempt from this system; we actively participate in it as we employ and are employed in some way or another. Since arriving in Manila Noor has learned, with a contented surrender, to take her time. The artist is a ball of frenetic energy, and admits to being so. “It is more real here”, Noor says of her newfound powers and independence. Nature is slow and steady, and so she chooses to do likewise. “I no longer just look at things now, I take my time” she remarks. 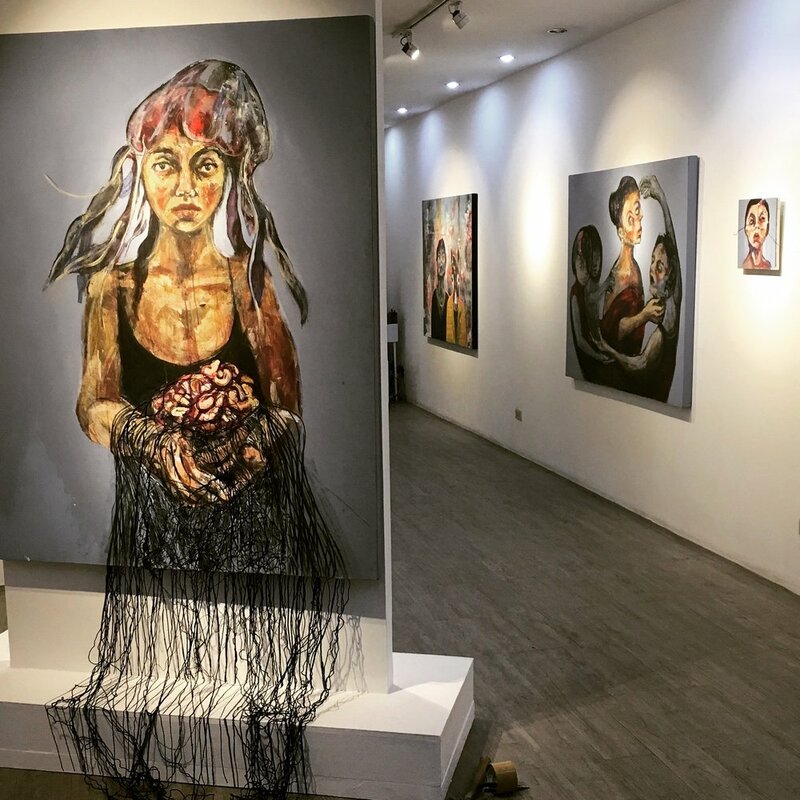 And one would have to agree—it takes a certain kind of sensitivity to distinguish mere looking, from actual seeing.Flora and natural forms populate the body of work she has completed here in the Philippines, and it is a small, albeit symbolically significant departure from her older work. There are shades of blush and other diluted colors that temper and work with the potency of her subject matter. It is this kind of balance that she has vigilantly labored on and painstakingly tried to earn for the past three months, to effectuate an equilibrium of sorts, not only in artistic creation but in the whole sphere of life and living as well. The gravity of her newly strengthened powers of observation has enabled her to not only position herself in this world of linked everything, but to question that very position as well. Here she questions her who’s and what’s and where’s. Privilege, duty, hopes, dreams and desires, war and peace—to Noor it is all a state of mind. You are what you make of your very existence.